"Whoever expands upon the story of the Exodus from Egypt is worthy of praise." Yes, here is yet another Passover Haggadah. But, the tradition encourages us to tell the story of the Exodus over and over and to retell it - and re-experience it - anew each time. This haggadah is intended for the contemporary seeking Jewish soul. For the person who is is seeking to re-enter the Exodus journey - the journey out of Mitzraim (the narrow place) into the unknown of the Wilderness (midbar - where we can hear God speak), and into the Promised Land, the land flowing with milk and honey (sustenance and sweetness). The Passover seder is certainly an occasion for us to remember our heritage and to retell the central story of our tradition, but even more it is an opportunity for us to reengage ourselves in the experience. After all, "In each and every generation, each individual should feel personally redeemed from Mitzraim." The seder as we know it was modeled after the Greek symposium - reclining around a table of food and wine engaged in a night of questions - on the topic of slavery and freedom. 'What' is different this night from all other nights! Wisdom - chochmah - is also koach mah - the power of what. In composing this haggadah, I am indebted to the teachings of many others. I borrow heavily from the beautiful insights and contributions that continue to shape our tradition. It is especially informed by the wisdom and teachings of Rabbi Alan Ullman. If you're interested in experiencing the Exodus journey as a deep personal transformation, you might want to consider the Personal Exodus workshop. If you find this haggadah useful please send a contribution to support this work. Contribute what you can; the suggested donation is $18 plus $1 for each participant in your seder. I also encourage you to respond with feedback, especially about your experiences using the haggadah. (Feel free to grab an updated copy if you've previously contributed for the hagaddah. It's been updated as of April 18, 2019. 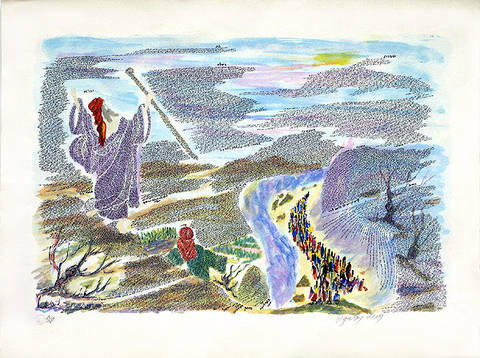 It has been expanded to include prayers for searching for and releasing chameitz; kiddush and havdalah prayers for when the seder falls on Friday or Saturday evening; the full Psalm 150 for Hallel; songs to sing afterward - Echad Mi Yodeia and Chad Gadya - and various additional clarifications and short explanations.